What are bed bugs and how did I get them? Bed bugs are found in homes, apartments, dorm rooms, hotel rooms, airplanes, public transit seats, cars and moving vans—pretty much anywhere they can find a human host. Bed bugs are parasitic insects, similar to head lice, that feed exclusively on blood. Bed bugs are mainly active at night, but are not exclusively nocturnal. They then attach themselves to clothing and other belongings and are (unknowingly) transported to new locations. However, you now have the power to detect bed bugs in time to prevent bites and infestation, with Bed Bug Alert. Bed bug bites can have a number of adverse health effects on humans and pets. Most commonly, humans can have skin rashes, psychological effects, allergic reactions and potentially more serious diseases. Bed bugs are known to carry at least 27 agents of human disease, including the drug-resistant bacteria (or “superbugs”) MRSA and VRE, and even Hepatitis and HIV (according to the Centers for Disease Control and Prevention journal). Scientists are still working to determine the threat of transmission. However, there is no reason to take chances when a detection system as simple as the Bed Bug Monitor exists. According to Wikipedia, "Bed bugs have been known as human parasites for thousands of years. At a point in the early 1940s, they were mostly eradicated in the developed world, but have increased in prevalence since 1995, likely due to pesticide resistance. Because infestation of human habitats has been on the increase, bed bug bites and related conditions have been on the rise as well." Most bug traps & glue boards only catch bugs if they randomly crawl across that particular area. 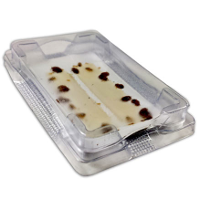 Bed Bug Monitors feature a semio-chemical gel that actively lure nearby bugs into the monitor. 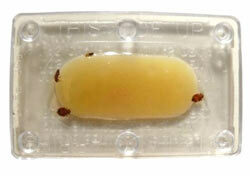 If you have bed bugs, some will be drawn into the monitor and become stuck to the adhesive surface, unable to escape. Simply place Bed Bug ALERT Monitors under the mattress or anywhere bed bugs are suspected, and monitor daily to detect problems before an infestation takes hold. Discreet. While the Bed Bug Alert is transparent for inspection, it is also near-invisible for discretion in public and private facilities and the hospitality industry. Immediate call to action. No need to wait for a major problem to show itself – bed bugs are drawn into the Bed Bug Alert by environmentally sound bed bug lure. If a bed bug shows up, immediate action can be taken to eliminate the infestation while it’s minor. Easy removal. Replace as required, creating a long-term, low-cost monitoring program. Safe and secure top snaps into the bottom so children and pets cannot touch the trapped bugs. Easy-to-use – clear viewing window makes inspection simple. Durable – resistant to weight and moisture, unlike paper monitors. Easy entry – five low-rising textured entrances encourage bug entry and harborage. Effective trap – large adhesive surface surrounds the lure. Early detection – attracts both adult bed bugs and 2nd instar nymphs. The proprietary chemical lure attracts the bed bugs into the monitor and traps them faster and more effectively than other devices. The patented housing is tamper-proof, protective of the chemical lure, making the product safe to use around children and pets. The monitor has a clear view window so the user can easily check to see if bed bugs have been detected and trapped. The monitor can be checked, reinserted and reused easily wherever bed bugs are suspected. Sturdy plastic construction prevents the glue and the monitor from being crushed while in use. Five low-rising textured entrances encourage bug entry and entrapment. Bed Bug Monitors attract both adult bed bugs and 2nd instar nymphs. Apartments and Homes - simply place under mattresses or couch cushions and check daily. Hotel Beds - keep a monitor in your luggage and test hotel and motels beds upon arriving. College Dorm Rooms - students can screen dorm room beds daily or when bugs are suspected. Dogs and Cats - monitor pet beds and anywhere they might lay for extended periods of time. Office Areas - screen office chairs, couches, sitting areas, lounge areas. Hospital beds, Hospice Beds and Senior Care Living - monitor these areas discreetly for your loved ones. Visual or dog inspection can cost hundreds of dollars depending on the size of the facility. Treatments/fumigation can cost thousands of dollars and may be charged per room; multiple visits are often required. Medical expenses of those suffering from bedbug bites. Legal fees from lawsuits filed by guests or employees. Loss of reputation regarding the quality and sanitation of the establishment. Being added to the online bed bug registry for the entire world to see! Negative psychological effects associated with bug infestations.